Head down the grain aisle of any supermarket and you'll be faced with a sea of uncooked, pre-cooked and quick-cook grains and pulses. With so much choice it's easy to be seduced by the gorgeous packaging and marketing efforts, but do they offer good value for money? 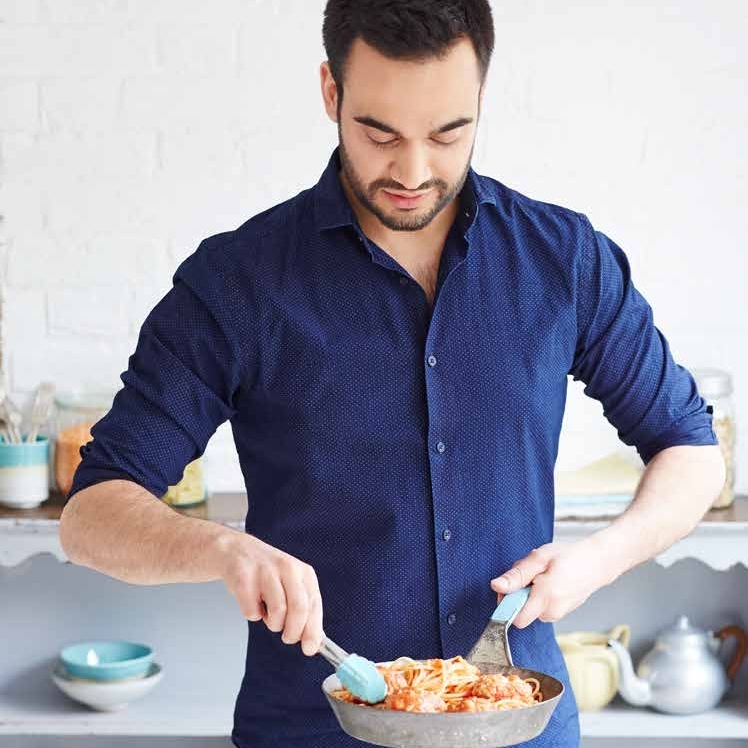 Last week I had a cooking session with Alex Mackay - who has an impressive career including Head of Development for Raymond Blanc Restaurants - and is currently working to promote Merchant Gourmet's new pre-cooked grain and pulses range. I really liked what I saw and tasted, but it got me thinking. Are they worth buying from a Tiny Budget Cooking point of view? As we all know, my goal is to champion good ingredients that help You save time and money, as well as simplifying the task of home cooking. So, to help you decide whether to purchase pre-cooked grains and pulses (Merchant Gourmet aren't the only brand), let's compare a simple recipe using Supermarket cook-at-home dry Lentils vs Merchant Gourmet's pre-cooked Puy Lentils. The Puy lentil is a special type of green lentil produced in France. The Test Dish: Halloumi & Lentils w/ Garlic Butter Mushrooms and Wilted Spinach. This is a beauty of a recipe that's both simple and full of flavour. It has tons of goodness and makes a great packed lunch or easy supper. It can also be adapted for meat eaters with the addition of a couple rashers of cooked bacon. The recipe requires 100g uncooked (250g cooked) lentils. We are comparing the Merchant Gourmet pre-cooked lentils with the 'cook at home' own brand lentils and focusing on time, taste and cost. Halloumi & Lentils w/ Garlic Butter Mushrooms and Wilted Spinach. Q1. Which was the quickest to cook? Merchant Gourmet's cooked lentils made this dish an absolute breeze to make. Just open the packet and gently heat the lentils in a splash of water (or microwave) whilst cooking the halloumi and mushrooms. The home-cooked lentils on the other hand took 30 minutes to cook in salted water giving the victory to Merchant Gourmet. MG Puy Lentils After reading the ingredients list of the Merchant Gourmet lentils I noticed they are cooked with onion, bay leaf, salt and olive oil. These additional flavours give a rich savoury taste to the lentils which is surprisingly delicious. Home Cook Lentils I cooked the lentils in boiling water and seasoned with salt, pepper and olive oil once they were cooked. The flavour was good and the lentil held its shape better than the MG brand but it lacked depth of flavour provided by the bay leaf and onion. I tested both dishes on friends and the verdict was split down the middle. Some loved the enriched flavour of the MG lentils whilst others found they were slightly overpowering and masked the flavours of the halloumi and mushrooms. Whilst both were delicious in their own right, it comes down to preference. It would be easy to recreate the MG flavours by cooking the dry lentils in water infused with an onion, bay leaf, clove of garlic, salt and a tbsp olive oil. If you have these to hand, the products are equal. If not, we think Merchant Gourmet wins. Q3. Which is best value for money? It's plain to see that the uncooked lentil offers real value for money at almost 13 times cheaper than the cooked lentils. However, the higher price may be a reflection of Merchant Gourmet's 'Puy Lentil' which are grown in a protected, specific region of France. Whether that is worth paying more for is up to you. If money alone is the biggest factor it's obviously best to buy the Supermarket Own Brand and I would recommend stocking up on uncooked lentils which you can cook in advance and freeze ready to use. Asda's lentils mentioned above are particularly good. The downside to cooking your own is you will need additional time and ingredients like bay leaves, onion, garlic and olive oil to get the same delicious flavours as the Merchant Gourmet lentil which sneaked the win on taste. Convenience is where Merchant Gourmet wins hands down. If you need to have something tasty on the table in 10 minutes I would suggest keeping a couple packs of their cooked lentils ready for these occasions. The additional cost is certainly worth the minimal effort. Merchant Gourmet are the UK's #1 for packet grains and pulses, selling over 34 Million packs in the last 10 years, with every pouch containing 100% single origin whether it be quinoa, freekeh, beluga or puy lentils. Are you more interested in saving money, or saving time and effort in the kitchen? Let us know in the comments below.